Summary of today’s show: After more than 3 years and 750 shows, The Good Catholic Life has come to an end. 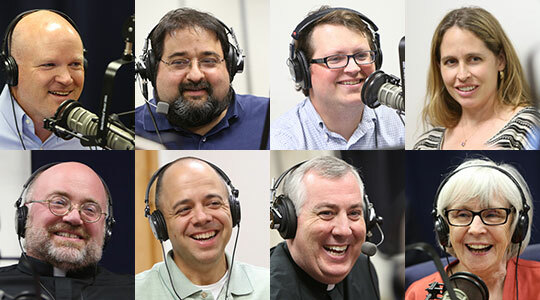 Scot Landry and most of the team who have brought the show to our listeners each day come together to relive the best moments of the show, to talk about the impact of the show on them and on listeners, and on the future of Catholic radio in Boston, especially future local programming to pick up where The Good Catholic Life leaves off. Thank you to all our faithful listeners and supporters. May God bless you and may you have a Good Catholic Life. We’d also like to thank: Fr. Chris O’Connor, Fr. Matt Williams, George Martell, Anna Johnson, Karla Goncalves, Fr. Paul Soper, M.C. Sullivan, Gregory Tracy, Fr. Roger Landry, WQOM and The Station of the Cross, our listeners, and our colleagues and families who have been so supportive of our efforts.